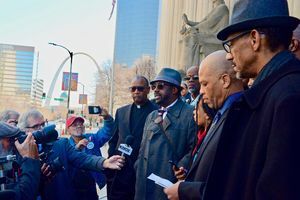 OBS stood in solidarity with the Concerned Citizens of St. Louis to support Kim Gardner’s indictment of Missouri Governor Eric Greitens. Gardner is the City’s first African American Circuit Attorney. Greitens was charged with a felony count of invasion of privacy connected to an extramarital affair he had in 2015. Gardner is catching hell for her prosecution of the corrupt governor making OBS wonder if this is 2018 and not times past Black folks couldn’t look whites in the eye or when Black police officers couldn’t arrest a white person. We say let Kim Gardner do her job!